Aromatherapy Mist to improve memory and alertness. A bright, clear smell! Superior aromatherapy. NO Alcohol, NO animal testing, NO toxic chemicals. Made with love in California. The highest quality non-GMO natural essential oil aromatherapy ingredients backed by scientific research. 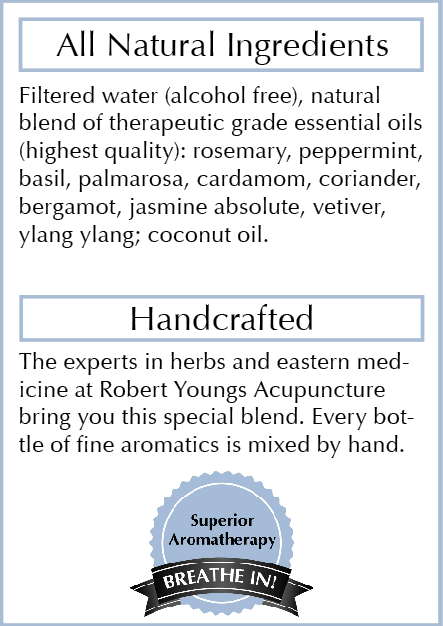 The world renowned uplifting essential oil spray from the experts in herbal medicine at Robert Youngs Acupuncture in Beverly Hills California. 10 ESSENTIAL OILS including PEPPERMINT & ROSEMARY proven in research to sharpen memory and leave you bright, focused and alert. I created and used this essential oil blend while studying for the medical boards in CA. It worked so well my colleagues asked us to make some for them. I gave it to a niece in college & her friends started asking for it to help them study and the aromatherapy blend “Focus” was born! Essential Oils are the distilled essence of the healing plants from which they are derived. Used for centuries, each essential oil has unique healing properties. Therapeutic Grade Essential oils are selected for this spray to create an exceptionally powerful mental, emotional and physical effect. Jasmine is a flower with a world-wide reputation for its strong but sweet, pleasing, and romantic fragrance. The aroma of Jasmine can alleviate depression. It fosters the release of hormones in the body that can boost energy and elevate the mood. If you’re having problems sleeping due to a persistent cough or a cold, jasmine essential oil can provide some relief by improving your lungs’ ability to clear out accumulated phlegm. It will also help clear up clogged nasal passages. Jasmine essential oil can help regulate menstrual cycles while reducing the pain associated with menses. It can also help retard the progression of menopause. Jasmine essential oil has a long history of improving skin conditions, especially proving useful in the treatment of dry or dehydrated skin. Its use in the treatment of eczema and dermatitis is well documented. Rosemary has recently been the focus of Alzheimer’s disease researchers. A study done in 2003 found that test subjects who inhaled rosemary oil while taking an exam displayed a significant rise in overall cognitive function. It is this apparent connection between inhalation of the rosemary oil and increased neural activity that has drawn the attention of researchers. Studies in 2007 showed that the use of rosemary in aromatherapy could decrease the level of cortisol (stress hormone) in saliva. Reduced cortisol levels can lead to a decline in the negative effects of chronic stress. Use of rosemary essential oil has also been shown to relieve the pain of headaches, muscle aches, and the pain of various forms of arthritis. It is known to stimulate blood flow, which can help in relieving pain. Most essential oils provide some degree of relief from stress, and peppermint is no exception. Peppermint is inherently refreshing by nature, and this lends it to the relief of depression and mental exhaustion. It can help calm feelings of restlessness and lower anxiety levels. It has also been shown in studies to help clear the mind, energizing mental acuity and giving a boost to cognitive tasks. Basil, or holy basil as it is commonly known, is widely considered to be one of the best medicinal herbs discovered. Keep a pot of it growing in your home to boost your family’s ability to fight off infections, cough, and cold. Inhaling basil’s scent may sharpen your sense of smell and improves mental alertness while clearing and refreshing the mind. Blood circulation can improve with the use of basil essential oil, and it can help optimize the metabolic functions within the body. Since basil contains Vitamin-C and other antioxidants, it can be used to soothe the nerves and alleviate the effects of stress, such as high blood pressure and susceptibility to inflammation. Basil’s effects on migraine headaches, whether caused by sinus pressure, the cough associated with colds or influenza, or high blood pressure, can be effectively controlled by the use of basil. Whether smelled or consumed, inhaling basil can refresh the mental alertness and refocus the mind. Because of its calming effect, basil essential oil is used in aromatherapy to treat nervous tension and depression, melancholy, and provide mental clarity and strength. Palma Rosa: Palma Rosa essential oil can be useful in reducing fever through its antibacterial, antiviral, and antiseptic properties. It can be applied externally to wounds to protect them from infection by killing bacteria. When used in aromatherapy, the essential oil of Palma Rosa can have a relaxing effect on muscles and nerves, fighting against depression and fatigue. It has also been used to enhance the mood, having an uplifting effect on the mind. Cardamom: Cardamom has become increasingly popular as an agent to counteract high cholesterol levels. Studies have shown it to have a positive influence in controlling cholesterol levels. Cardamom essential oil is frequently used in aromatherapy, its properties helping to decrease the effects of depression. It is also used as a protection against a number of gastrointestinal disorders that manifest through acidity, flatulence, and stomach cramps. Cardamom has traditionally been used as a treatment for dental problems. Studies have shown that the antimicrobial effects of the spice do not interfere with the beneficial probiotic bacteria of the digestive system. Not only can coriander spice up your food, it can also add spice to your love life. Coriander oil can arouse and increase the libido, and may function as a temporary cure for impotency. To improve gastric functions, coriander taken internally can help eliminate excess gas and help relieve cramping by regulating stomach functions. Coriander can also be used to improve appetite, and helps in the alleviation of nausea and vomiting. It will warm up organ systems and boost the spirits, helping in the fight against depression. It can also be used topically as a deodorant. Though not a well-known ingredient, it is the addition of bergamot essential oil in regular black tea that produces the Earl Grey variety that many enjoy. Bergamot’s properties make it an ideal antidepressant, generally stimulating the mood and raising the spirits. It stimulates the secretion of digestive juices, helping regulate digestive processes and lowering blood sugar. Bergamot has been shown to have natural antibiotic and disinfectant properties. It has been recognized in studies as an agent that inhibits growth of bacteria, fungi, and viruses. Vetiver essential oil has a soothing and cooling effect, making it useful in the treatment of inflammation in the circulatory and nervous systems. The oil extracted from vetiver efficiently retards the growth of the bacteria Staphylococcus Aureus. It has been shown to help in disorders of the nervous system, especially those attributed to shock, fear or stress. The sedative effect of vetiver can be used to calm nervous irritations, convulsions, and emotional outbursts such as anxiety, anger, and hysteria. It can also help in the treatment of insomnia. Ylang-Ylang essential oil is one of the oldest known methods for treatment of depression. Its effect is said to be relaxing for the body as well as the soul. It is useful in negating the effects of anxiety, sadness, and chronic stress. One of the most useful properties of Ylang-Ylang is its ability to combat the inflammatory conditions of the skin that cause seborrheic eczema by regulating sebum production. The essential oil is also quite effective in decreasing blood pressure. To complement the hypotensive effect, this essential oil can provide sedative effects to combat anxiety and stress.